The speedo cable on my 72 450 is approx 10 inches too long. Is there a shorter cable available ? Sounds like a previous owner had high bars, or extended forks, and didn't put the stock cable back. Can you measure the cable you have? We can compare that measurement to one of ours. Another thought; do you have the little plastic loop on the fender through which the cable routes, and takes up some length in that curve? Last edited by WintrSol; 04-15-2019 at 07:32 AM. The cable is 38” end to end. I also have the little tab circle on my fender that I run the cable through. 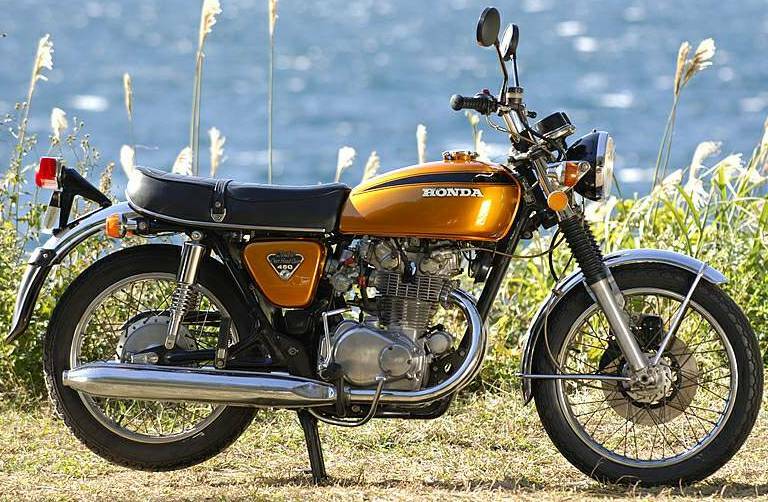 In a recent post about Police bikes, a CB 160 was shown in a picture with the correct routing...(almost identical to the 450's)..
Last edited by 66Sprint; 04-15-2019 at 08:59 AM. Mine has the disc brakes on the front wheel and the cable enters the front wheel on the right side it then goes through the fender guide loop and straight up to the speedo. There should be two guide loops: the metal wire loop on the fender brace, and another plastic one on the fender, roughly 2/3 the way from where the brace attaches at the back to the center of the fender. This forces the cable to curve in front of the triple tree. Last edited by 66Sprint; 04-15-2019 at 05:23 PM. How long is too long for bike to go unused? How long does it take your bike to cool down after a long ride?